After Cave Connection, we went back to our guesthouse and rest for awhile. The original plan is to go to Bomod-Ok Falls after Cave Connection but that doesn’t happen because of time constraints and exhaustion. It was already 4:00 PM and we haven’t taken our lunch yet so some of us just ate the left over buttered chicken and pork asado from Good Taste (where we had our lunch in Baguio yesterday). It still tasted good! I even finished 2 piece of buttered chicken and some pork asado. 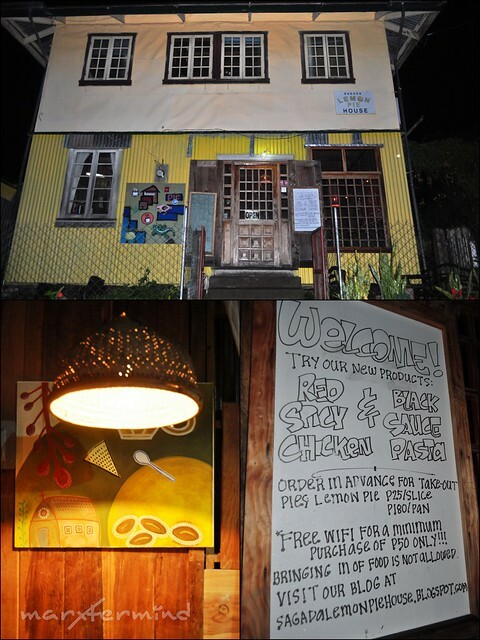 While waiting for the others to be ready for early dinner, me, Ivan and Robbie went to the Lemon Pie House to make dinner reservation. It’s good that we came a bit earlier before the number of guests came in to dine. We were able to secure our seats before the restaurant went full. The place was good and cozy. Felt like a cafe. We then took our orders while waiting for the others. According to the perky lady (restaurant staff), their best seller is pinikpikan but that needs to be ordered days in advance. There are only few selections from the menu which made me hard to decide what to eat. They have new products, spicy chicken and black pasta. 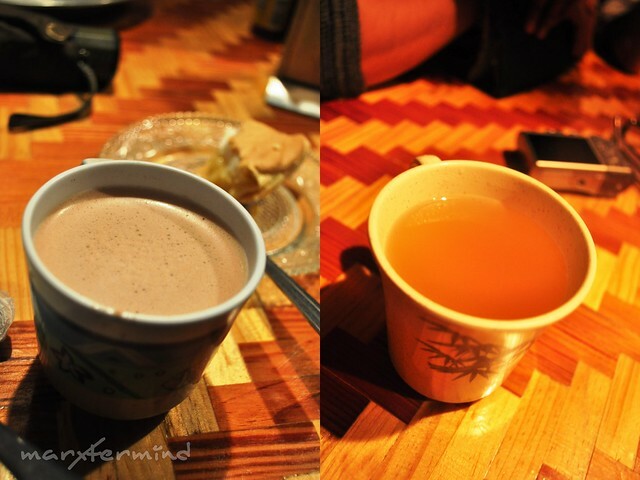 I love spicy food so I just ordered the spicy chicken then hot chocolate. The black pasta sounds intriguing. She said its a Korean flavored pasta. We also ordered 2 Lemon Pies for the group, each costs PHP 180.00. After a few minutes the rest of our group, came in. Then they took their orders. While waiting for our food to be served the group shared some stories (and I just listened to them – quiet type!). I like the lemon pie. I love sour fruits which made me enjoy the pie. 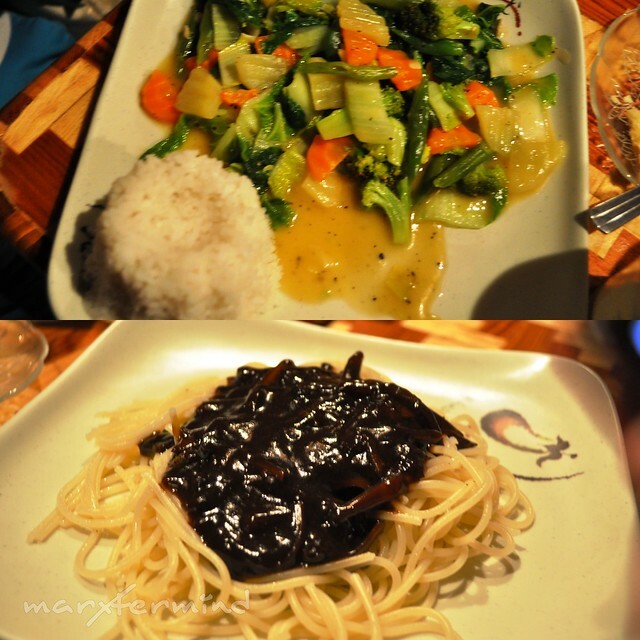 It took a long time for our food to be served especially the Black Pasta. If it’s not because of the very accommodating and perky lady (restaurant staff), then I would be displeased on their slow service. And here’s my spicy chicken… and the rest of the food. The spicy chicken was OK. It wasn’t that great but it wasn’t bad at all, just okay! 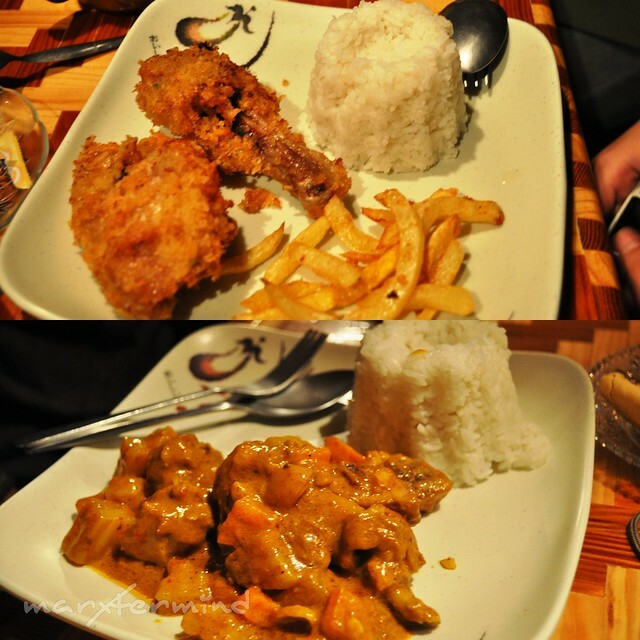 Some said that they didn’t find the Adobo pleasing. 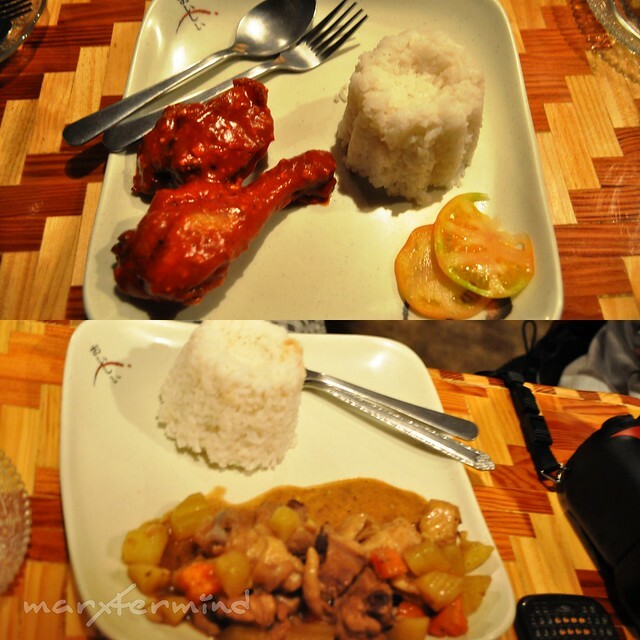 It seems that it didn’t taste like one, it resembles another dish and not adobo. One of our mates ordered Black Pasta so I asked for a taste of it. Then the taste? Hmmm… Weird! It was okay but nothing spectacular. They said the closest pasta that tasted like this is Charlie Chan from Yellow Cab. 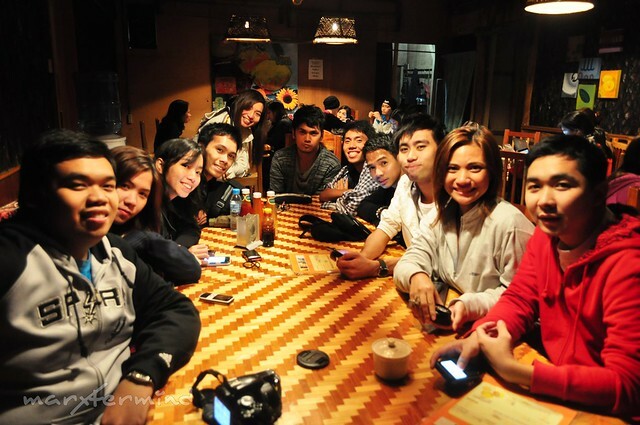 Moreover, we still had a good dinner bonding in Lemon Pie House. I even brought home a box of Lemon Pie. She said it will last for 3 days so I ordered one then I’ll just pick it up the next day. Afterwards, we went back to our guesthouse and had a surprise birthday cake for Robbie! Then watched Kababalaghan before we slept. Katatakukatan mode for the Halloween! Haynako… medyo fail talaga yung pagpili natin dito. =( Sana sa breakfast na lang natin to sinubukan. At kitang kita na sa mukha ko na aburido na ako. Hahaha. 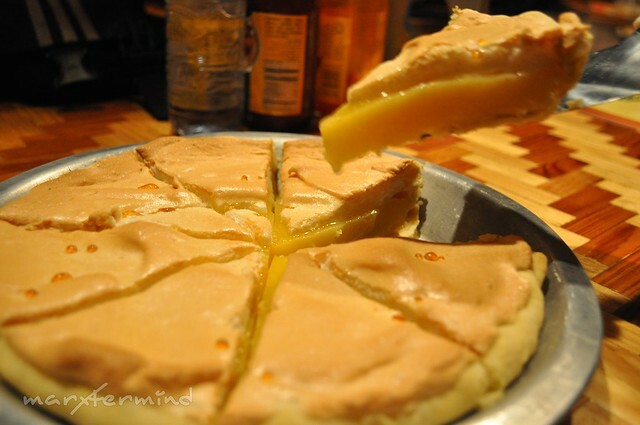 di pa ako nakakatry ng lemon pie….. makes me wonder ano kaya taste non. lol.. namimiss ko si ate Loida (loida nga ba?).. yung itsura ni robbi sa last pic, haha parang papatay lang ng tao.